The WWE’s Money in the Bank PPV is just around the corner and we are guaranteed to see a new WWE world heavyweight champion. But who will it be? Cena? Orton? Wyatt? How will Kane factor into the decision? 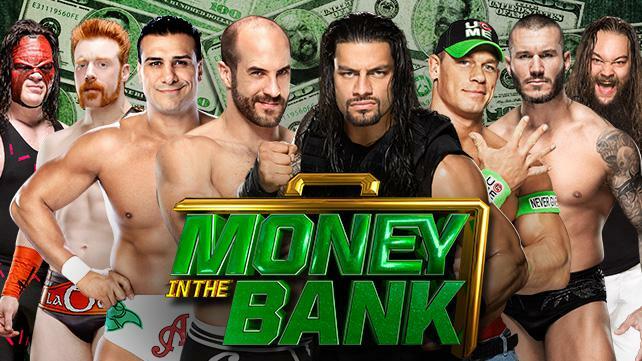 Will the winner of the seven-man Money in the Bank contract ladder match make an appearance late in the evening to cash in his newly won contract? All questions that will be answered on Sunday, but before then Turnbuckle Radio hosts Brian Swane and Trevor Robb share their thoughts on the weeks leading up to the highly anticipated PPV. They will also break down the Wyatts vs. The Usos tag team championship match, Daniel Bryan’s future and just what is going on with Stardust and the lacklustre Big E vs. Rusev rivalry. Tags: 780 Sports, Alberto Del Rio, Big E Langston, Bray Wyatt, Daniel Bryan, Dean Ambrose, Dolph Ziggler, Edmonton, John Cena, Kofi Kingston, randy orton, The Shield, Triple H, Turnbuckle Radio, WWE, WWE Raw. Bookmark the permalink.